1. Doing what you love to do allows you to be yourself. 2. It is perfectly integrated into your lifestyle. 4. It’s the perfect fit. 6. You are aligned with the things for which you are passionate. 7. You are able to make a difference to the things that matter to you. 9. Your life is arranged so you can live a meaningful life. Bellows then asks the reader to imagine that work is more than just a paycheck. What would the workday of your dreams look like? How would it begin? What time would you wake up? What would your clothes look like? What would you do? What are you paid? Is it quiet? Is it busy? To whom do you report? We’ve all asked ourselves these sorts of questions before. The rest of the book builds on this foundation, offering exercises to help you answer each of these questions for yourself. If you want to make the most out of this book, like the others’ I’ve reviewed, you need to do your best in answering the questions. I recommend finding a good journal to take with you—this will make answering these questions easier (having the right tools for the job always makes it better). Ultimately, Bellows’ purpose is to make you ask, “Who am I?” As she says, “You have to know what your interests are and what you are passionate about. You need to explore your values and assess your skills, your strengths, and your talents” (72). 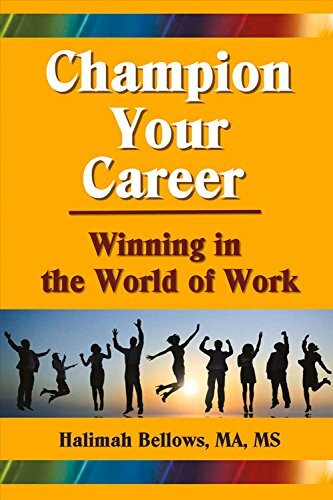 Because this is a question that we all need to ask, I highly recommend “Champion Your Career: Winning in the World of Work” by Halimah Bellows if you are at all unsure about what you are currently doing.